Although the support for this has been around for quite a while, I've rarely come across the sites non-Latin based languages having non-ASCII based URLs or IDN. Part of the reason for this are spoofing concerns such as the Cyrillic "а" looking a lot like the Latin "a" and misleading people since they look so identical, resulting on it not supported or enabled by default. you might see when hovering over a link in eg. Firefox (of course, that article in question does not exist) and it's obviously longer, but that's not what I'm talking about here. Enter the URL you want and hit enter. If you are using IE8, the converted URL might appear for only a second before redirecting to your default search engine. You should see this or an error message below with that same url. "www." might be automatically added. 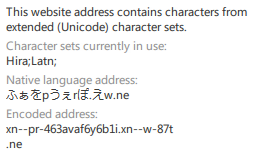 In IE8, you can check both the native and encoded addresses and even what type of characters were used. The encoded URL would appear just as you type it. Yes, it's that simple for Chrome. Anyways, copy that encoded URL, edit out unwanted parts (if necessary), register it, and you're done! I would like to see this take off, but I don't want people using Cyrillic characters to mislead others into thinking they are the look-alike Latin characters. Also, can we hide "http://"? The person who invented it didn't want that to appear too. "www." is also redundant and a mouthful to say out.